I think it depends on the age of the sitter for the rate - also, perhaps just ask her what her rate is? If she babysits a lot, she will know her rate. Yes provide dinner - as I used to babysit a lot in high school and junior high - it was usually a smally frozen pizza, or something like that - or when the kids were older whatever they were having. Make sure you leave her with a list of phone numbers to get a hold of you as well as perhaps an "adult" neighbor. Texas Gal - thanks! Yep I know she'll have a rate, but we're so dumb. She could be like, $25/hr and we have no clue and say, OK! OK maybe not that off, but seriously - we just don't know what the average is. Her parents are definitely in the know and live just down the street. I've followed your blog (from Kelly's prayer blog) when I found out you were pregnant. Hope that's not creepy ;o). I have been baby-sitting since I was 10 (am now 30) and loved your questions so I had to comment. You ask questions I always wished more moms would ask. No need to provide dinner. Let her know she can help herself - or if there is something leftover from your dinner tell her to please eat it! Tell her TV and phone is free reign once the baby is sleeping. It's always uncomfortable if you aren't sure what the parents would like you to do when the babes asleep... Make sure she knows that if she's vegging on the couch watching TV when you get home that would be alright. Good luck! I know it'll go wonderfully. Blessings to your family! Missy - thank you, such a help! Good thought on the TV, etc. Glad to have a sitter's perspective. I only sat a handful of times as a teenager. Would not have thought of the key/code thing - thanks! Yep, I totally agree with Missy. No need to provide dinner, let her know about the TV, list of numbers, etc., and we pay our babysitter in the range of $8-10/hr. At least in Chicago my friends with children pay between $10-13 per hour, I think. I would say at least $10 but ATL might be cheaper. We pay about $10 an hour but often people pay $8 for one kid. I usually tell her what we have around for dinner- mac and cheese, sandwich stuff, leftovers, pizza, etc but often her dad brings her dinner when he leaves work (she's really picky and readily admits it). I always let her know where the junk food is (but she rarely touches it). She often does homework after the kids are down (awwwww.....) but if not, she watches tv. She has our password for our computer too. I text our babysitter at least once while we're out to make sure that everything is okay. She doesn't mind and it makes me feel better. I know most of my friends text with their babysitters as well. I've babysat since like 7th grade and I'm in college now. I wouldn't worry about food just let her help herself to what you all have. In St. Louis the going rate is $10 or so. I would show her how to work your TV. Some can be so complicated. Also, if you all have a complicated phone/alarm system etc show her that. Also tell her if you want her to answer your home phone. I'm sure it will be great! She seems like a great girl! I got paid $10/hr when I was in high school. And right out of college, $14/hr. But around here I think people currently pay in the $8-12 range, depending on the sitter. So I would call and ask the rate before hand to make sure you have enough cash. Your church pays you back? I need to hear that story. I'm confused. PPC - Yep they reimburse us for childcare during church functions like small group, volunteer things, etc. Reason being, they don't want you to NOT get involved in groups or serving because of the childcare cost. It's done for events outside of the church generally, but there are some events at the church where they'll reimburse you too. VERY cool. And they want us to use it. Some people have a hard time with taking advantage of it, but they are like, no - we budget for this because it's important for you to do these things, so please use it! I've only had my mom watch Landon, so I don't what what the deal with teen sitters is now, but I can tell you what went down when I used to babysit a ton about 10 years ago. I was 17ish and I'd get $10/hour. Dinner was left for me and it was usually something like a frozen pizza, mac and cheese, etc. A lot of time I had to cook the kids dinner (I used to babysit kids around ages 2-4.) and I'd just eat whatever they had. 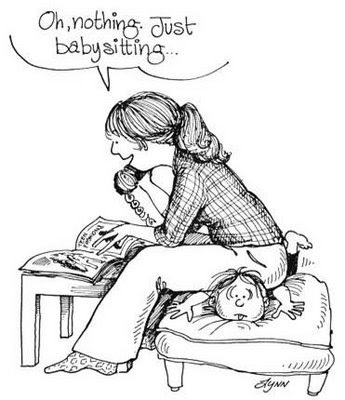 The key is to make it something super easy for the sitter. One woman I used to babysit asked me what my favorite snack was and she'd make sure she had some of it for me. That's not needed, but it was a nice touch and I remember it all these years later. I also liked when the parents left the TV remote out for me so I could watch it after the kids went to bed. I'd leave your and your husband's cell phone numbers, and your son's Dr's number just in case. I think parents also used to leave me the number for poison control too just to be safe. When I have my mom watch Landon I write out his nighttime routine so she doesn't forget anything, and I make sure his PJs, books, etc. are all picked out ahead of time. I was a nanny in college and because I was at their house a set time everyday, I was paid $8-$10/hour for their one daughter. She was 9 so pretty self sufficient. If I was doing just a one time deal, I'd give her $25-$30. I mean if you're only gone 2 hours, what's the girl going to do with $16? I wouldn't make her dinner or anything, but maybe leave a few snacks out for her so she knows she is welcome to them. I agree with the comments above. I paid $10/hr for a senior girl to watch Emma-she came from 6-8 once a week. We didn't provide her dinner, but I told her to help heralded to anything. We obvi left phone numbers and I showed her how to work the tv. I normally pay about $8/hour for the teenage girls we use. But I also round up so if it was $16, I would give her $20. It is easier for me that way. Depending what time she comes, I either have enough dinner for her as well as the kid. If it is after dinnertime, I used to leave snacks out for her. Now she is used to our house and knows she can get whatever from the pantry. She is 16 so she watches tv and texts when the kids are in bed. But sometimes she brings her computer to do homework so we gave her our wifi info. And of course, leave her all the important phone numbers. Then relax and have a great night out! We pay 10 an hour here in Ca. for teen sitters. I usually write out the schedule and leave it on the counter and put all our important info on the fridge like local family phone numbers, our cell and the name of our doctor. We are still getting used to having sitters that aren't family. I've learned that some eat before they come and some don't. It is better to have snacks on hand or something already made. Make it as easy as possible for them. Lay out some fun magazines if you have them and show her how to use the tv. Good luck and enjoy your time away.